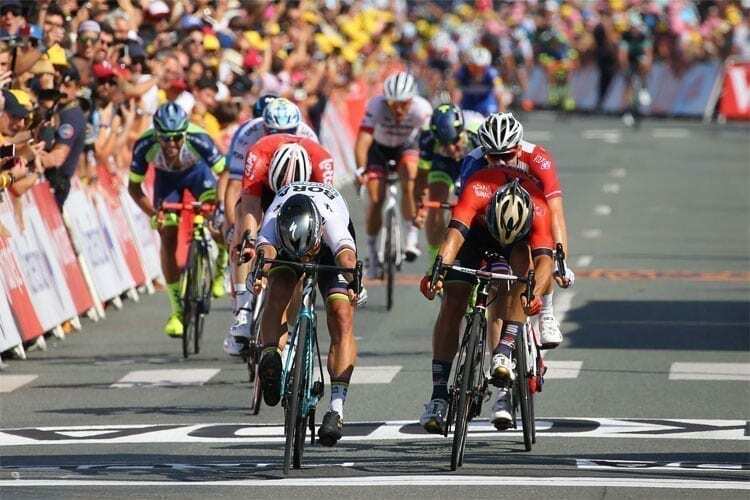 After being so narrowly beaten to the top spot on yesterday’s opening stage of the Tour de France, the UCI World Champion, Peter Sagan, wasn’t going to be denied today. 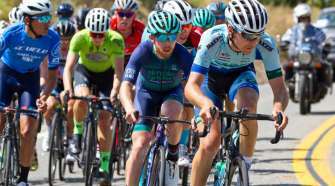 In a final 2km that saw a crash split the peloton, taking out some of the Tour’s big name sprinters, Peter was ably supported by his BORA-hansgrohe teammates to take the victory in a reduced bunch sprint. Taking his first stage win of the 2018 edition of the race, the Slovak rider was propelled not only into the lead in the points race, but he became the first BORA-hansgrohe rider to wear the prestigious Maillot Jaune of race leader. For stage 2 of the Tour de France, riders were taken on a tour of the Vendée department. While the start in Mouilleron-Saint-Germain and the finish in La Roche-sur-Yon were separated by only 50km of road, the race would head north before looping back around for the finale, making a total of 182.5km. The King of the Mountains points would be settled early on in the day, with an easy fourth category climb in the first 30km, but with the remainder of the day being flat, it was to be a second day where the faster riders would look to control the race and take the finale. While further inland than yesterday’s stage, today would still see the possibility of the peloton being affected by winds from the Atlantic – especially towards the later parts of the day. 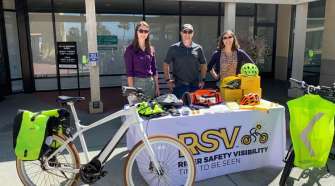 For those looking to take the win, this would mean keeping safe in the bunch and not allowing the day’s excitement to affect them. 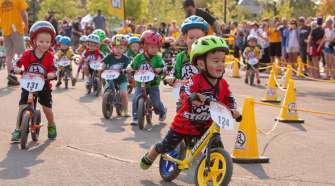 Having taken second on yesterday’s opener, the UCI World Champion, Peter Sagan, would be aiming to take advantage of a slightly more undulating final kilometre, but with a challenging final few kilometres and high speeds expected, the BORA-hansgrohe riders would be working hard to keep the Slovak rider safe in the finale. Having finished strongly with the bunch yesterday, Rafał Majka would again aim to keep out of the mayhem of the sprint and arrive safely today. The day started with a group of three going on the attack and leaving the peloton in their wake, taking 1:30 in less than 10km of racing, but after the categorised climb had been conquered, two of the trio dropped off, leaving just one rider in the escape. Unperturbed, this solo rider pushed on, building the lead to 4:30 before the peloton started their efforts to draw him back in. With 50km remaining, the UCI World Champion, Peter Sagan, was first in the bunch to take the points in the intermediate sprint, and this surge in pace reduced the break’s lead even more. With the peloton approaching the final 10km the catch was made and the sprint teams took their place on the front of the peloton. The red and white stripes of Austrian National Champion, Lukas Pöstlberger, headed up the bunch, with the BORA-hansgrohe riders massing to protect Peter Sagan through the twists and turns of the last 5km, Marcus Burghardt and Daniel Oss riding close behind. A huge crash with 2km to go split the bunch, taking out some of the big names and leaving just 14 riders to contest the sprint. Staying out of trouble, there were three BORA-hansgrohe riders in this group, including Peter, who kicked hard, found space and once he had clean air in front of him, the stage was his. 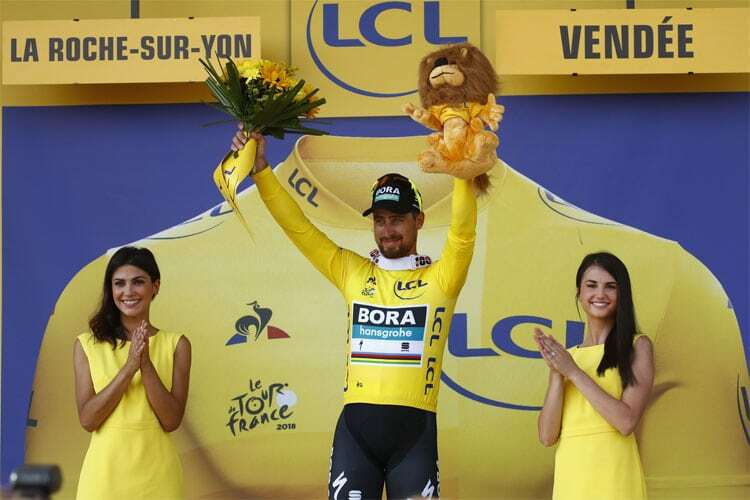 The Slovak rider took his first stage victory of the 2018 Tour de France, BORA-hansgrohe’s third Tour de France stage win and the Maillot Jaune for the second time in his career and was the first rider in the team’s history to wear the coveted Yellow Jersey.